"Gopher" redirects here. For other uses, see Gopher (disambiguation). The pocket gophers are burrowing rodents of the family Geomyidae. These are the "true" gophers. Several ground squirrels of the family Sciuridae are often called gophers as well. They are not true gophers,though. The name "pocket gopher" on its own is used for a number of subspecies of the family. 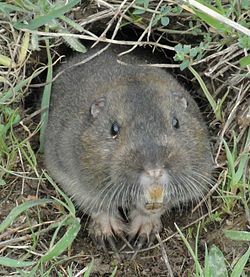 Pocket gophers, despite being largely a pest, are a symbol of the U.S. state of Minnesota, sometimes called "the Gopher State". Pocket gophers are widely distributed in North America, extending into Central America. Gophers are heavily built, and most are moderately large. They usually weigh a few hundred grams. A few species reach weights approaching 1 kg. Most gophers have brown fur which often closely matches the color of the soil in which they live. Their most characteristic feature is their large cheek pouches. The pocket in their name comes from these pouches. These pouches are fur-lined, and can be turned inside out. They extend from the side of the mouth well back onto the shoulders. They have small eyes and a short, hairy tail which they use to feel around tunnels when they walk backwards. All pocket gophers are burrowers. They are larder hoarders, and their cheek pouches are used for transporting food back to their burrows. Gophers can collect large hoards. Their presence is unambiguously announced by the appearance of mounds of fresh dirt about 20 cm in diameter. These mounds will often appear in vegetable gardens, lawns, or farms, as gophers like moist soil. They also enjoy feeding on vegetables. For this reason, some species are considered agricultural pests. They may also damage trees in forests. Although they will attempt to flee when threatened, they may attack other animals, including cats and humans, and can inflict serious bites with their long, sharp teeth. There has been much debate among taxonomists about which races of pocket gopher should be recognised as full species. There are about 37 species in six genera. This page was last changed on 13 July 2016, at 10:49.